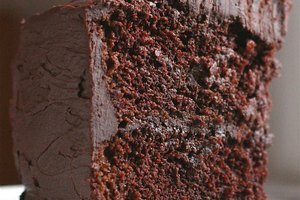 One of the most familiar cake-baking problems, for amateurs and professionals alike, is cakes' tendency to puff and crack in the middle. At its mildest, this flaw — known as "doming" or "crowning" — is a minor inconvenience. The rounded surface can simply be trimmed off, if necessary, to level the cake for decorating. If your cake domes badly enough to crack, on the other hand, it can be a sign of more significant problems in your recipe or technique. Here are a few things to double check to avoid this issue. Extreme doming and cracking are often the result of baking the cake at too high a temperature. The outlying areas cook and firm up too quickly, leaving the cake's crust without enough flexibility to cope with the cake's rise. As a result, the middle bursts through the set crust and causes cracks. The thermostats in home ranges are seldom completely accurate, so that's a good starting point for your troubleshooting. Purchase an inexpensive oven thermometer, and use it to check your oven for accuracy. Your oven might run 10 to 25 degrees Fahrenheit above its set temperature, and a variance of up to 50 F is far from uncommon. Reduce your oven temperature accordingly. Your cake pans can cause similar difficulties, depending on their material and color. Heavy, dark pans tend to absorb more heat from the oven and transmit it to your cake batter with a verve that might be laudable in other circumstances. Unfortunately, the effect — once again — is a domed and cracked cake. Switching to light-colored pans, or reducing the oven temperature by 10 to 25 F, can help. 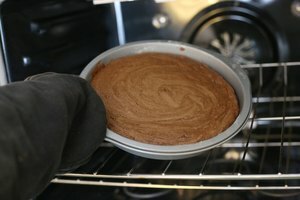 Pan placement is important as well, since a cake baked on the oven's top rack is more prone to cracking than one baked in the middle. It's also possible to minimize crack-producing, uneven baking by providing your cake batter with a protective layer of insulation. Most department stores and kitchenware stores sell insulated fabric strips designed to wrap around your cake pans. These inhibit the transfer of heat from your oven to the batter, helping the cake bake evenly from its edges to its center. The strips prevent the outlying areas from firming too rapidly, yielding a mostly level surface with no cracks. Silicone cake pans also insulate the batter, and they can be especially useful with recipes that taste wonderful but are stubbornly prone to doming. If your oven temperature is correct and you're already using light-colored pans, you might need to look in your mixing bowl for a solution to your problems. Sometimes, your batter is simply too stiff. Adding a modest quantity of water or milk — as little as a tablespoon — can sometimes have the desired effect, moistening the batter and keeping it soft for an extra few minutes. Alternatively, increasing the butter or oil by a tablespoon or two can also help prevent cracking, by softening the crust and lubricating the gluten that gives your cake its texture. A cake with too much baking powder or soda can also crack even when baked correctly, so reducing your leavening slightly is another option. 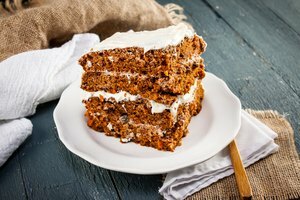 If your cake still cracks after addressing these other variables, the culprit is likely to be gluten development. The gluten-forming proteins in your flour help give the cake its structure, but too much gluten can make it dry, leathery or crack-prone. All-purpose flour can vary in its gluten content, so try fine, low-gluten cake flour instead. Pastry flour is a good alternative, in a pinch, or make a substitute by removing 4 tablespoons of flour from each cup and replacing it with 2 tablespoons of cornstarch. To minimize gluten production during mixing, beat or stir your batter just as much as the recipe suggests, and no more. 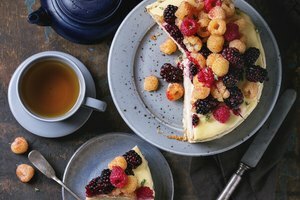 Real Baking With Rose: Why Cakes Dome?